It’s a Jeep thing – and I definitely don’t understand it fully – but after spending a few miles behind the wheel of the all-new 2018 “JL” Wrangler Rubicon (with a huge grin on my face) I can definitely see why Jeep culture is so strong. It’s just a shame I had to experience it in the urban grid of central Phoenix as opposed to the red rock Mecca of Moab. Maybe next time I’ll sneak away for a more “extended test drive” (wink, wink). 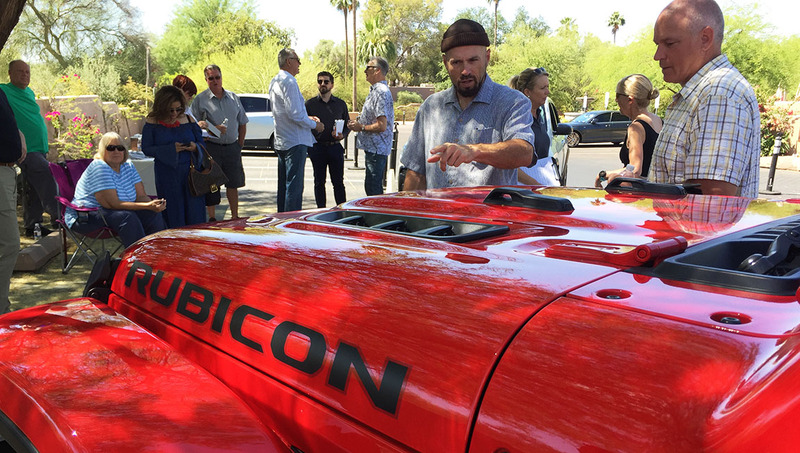 Fiat Chrysler Automobiles (FCA) hosted a handful of members from the Phoenix Automotive Press Association (PAPA) last week for an up-close look at some of the brand’s new products, including the the Wrangler, refreshed Cherokee, and all-new Ram 1500 pickup truck. With typical generations lasting upwards of 10 years each, engineers have to work extra hard to make sure their vehicles will withstand the test of time both mechanically and aesthetically. The Wrangler’s iconic shape has changed very little over the years, and that’s for good reason. But its underpinnings are as advanced as any modern vehicle should be. We received a demo from representative Trevor who showed us how the soft top mechanism operates and how the windshield folds completely flat. Did you know that the fold-flat windshield feature dates back to wartimes, when Jeeps had to be packed as tightly as possible into crates for overseas transport? I think it’s cool how Jeep has preserved some of those nostalgic features. The entire vehicle has been built to endure any kind of abuse thrown at it. Pre-production JL Wranglers were put through 16 hour “mist tests” with non-stop exposure to water, and all of the dash and electronic components still operated successfully. There are a total of 5 USB ports in the vehicle. Just when you thought there was a competition to incorporate the most cupholders in a vehicle, Jeep has now done it with USB ports. Cuz you gotta have your iPhone fully charged to capture video of that next summit up Hell’s Revenge trail. Yikes! 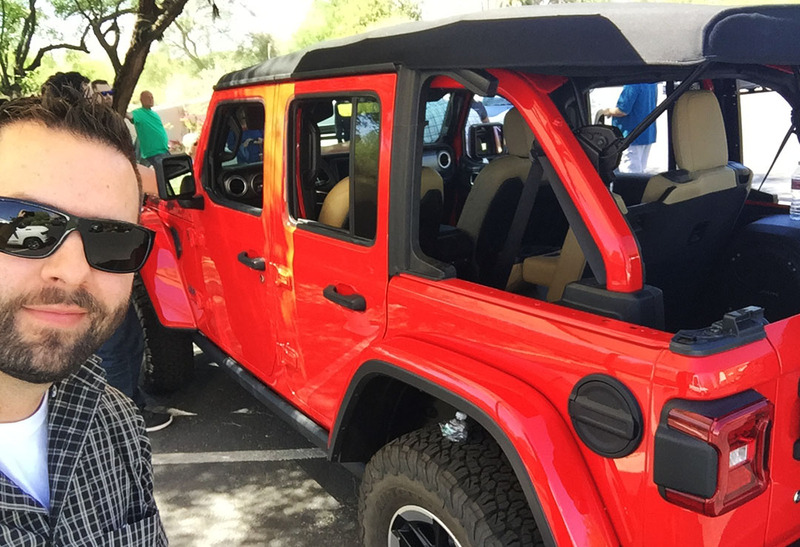 The Rubicon that I drove was a 6-speed manual, 4-door in Firecracker Red. It took me a minute to get accustomed to the clutch engagement point but once I made my way out of the parking at Lon’s at the Hermosa, I was enjoying every minute of having the wind my hair and the sun on my face. 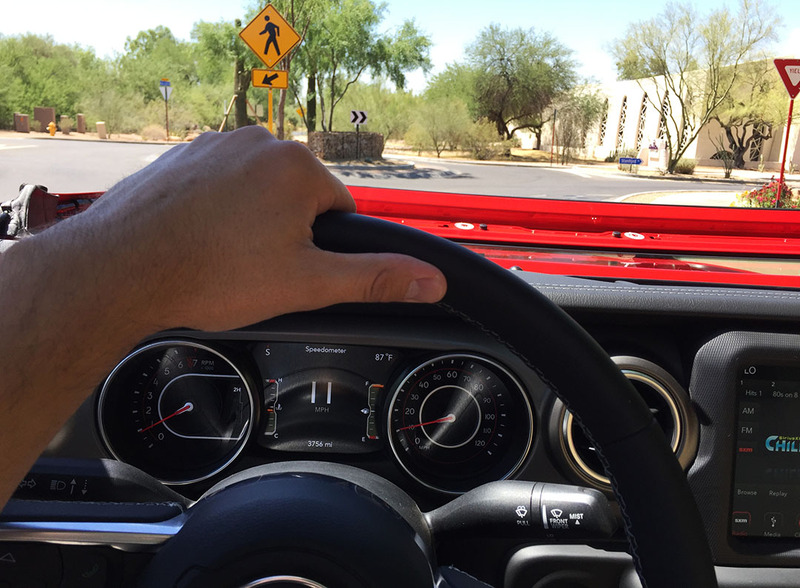 The Wrangler is just an all-around fun vehicle to drive – and for being such a capable off-roader, it surprised me how gracefully it handed city surface streets in and around the Paradise Valley area on my 6-mile drive loop. 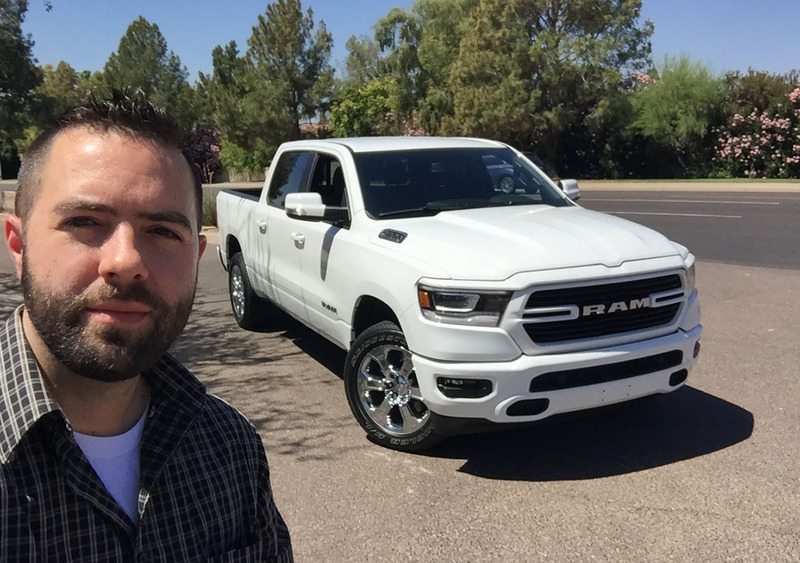 My favorite Ram was the Bighorn in white – a truck so advanced, it practically drives itself… through any terrain… with a trailer. Throw a task at this truck, and it will probably reign victorious. Ram trucks are now available with a largest-in-class 12″ touch-screen, 100+ safety & security features, and a 360-degree surround-view camera. Some of the other features I found impressive were related to towing. The truck itself is long enough to begin with, but adding a boat or camp trailer behind it makes for a pretty nerve-wracking driving experience. FCA engineers have lessened the stress by developing a blind-spot-monitoring system which smartly takes into consideration the length of the trailer AND the truck combined. Now that’s smart trucking. Thanks to Scott Brown, Carrie Owens, and others who made this midday press preview possible! 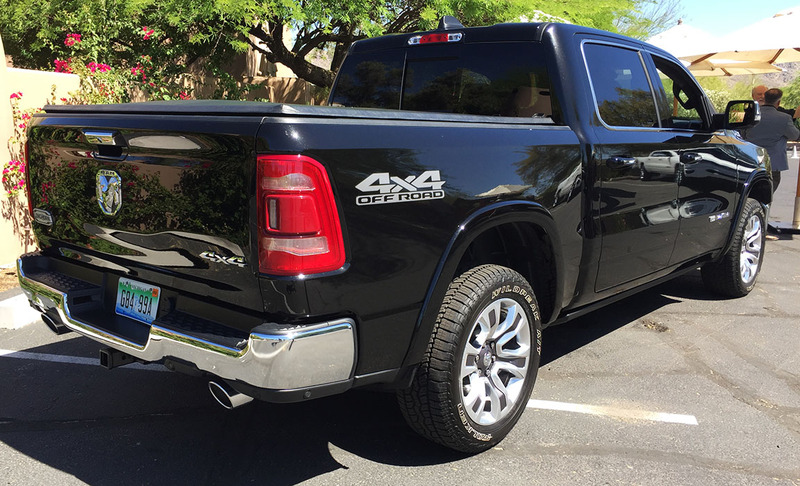 Ram Longhorn 1500: 20″ wheels, heated seats all around, and genuine wood & leather interior. Might need to get me one of these babies! This entry was posted on May 21, 2018 at 1:29 pm and is filed under PAPA. You can follow any responses to this entry through the RSS 2.0 feed. You can leave a response, or trackback from your own site. That seems like an awesome experience, Tyson! I too am impressed with the little nods to their history that Jeep includes in their vehicles. My fiancée’s Grand Cherokee’s owners manual comes in a burlap case that would have looked like something an Army office would carry his field manual in WWII, and the original Jeep logo is in WWII US Army Stencil typeface. That vertical ascent of Hell’s Revenge looks fun. Think we should try it with the Legend and the Accord? Haha, fat chance on any off-roading in the Legend! Sometimes I do think it would be nice to have a high clearance / 4×4 vehicle around, for some backroads exploring. I’ve borrowed my sister in laws Wrangler Unliminted 6MT a few times when the weather is nice. Its quite slow compared to my car collection but open air ride is fun. Agreed, plus that all-terrain capability. Sometimes I might want to climb a mountain or two. I’m still not sure if I’m a fan of the front of the Cherokee, it just looks a bit too flimsy and wedge-like. 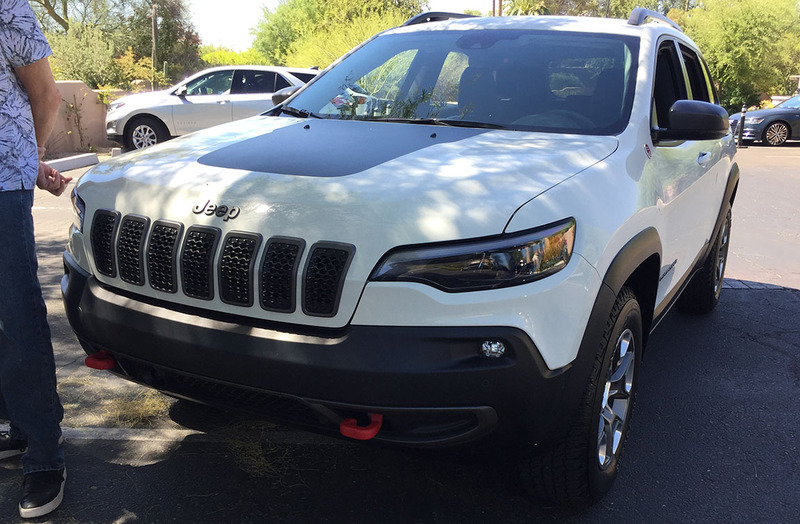 The older Cherokees with boxy front are an icon, though! 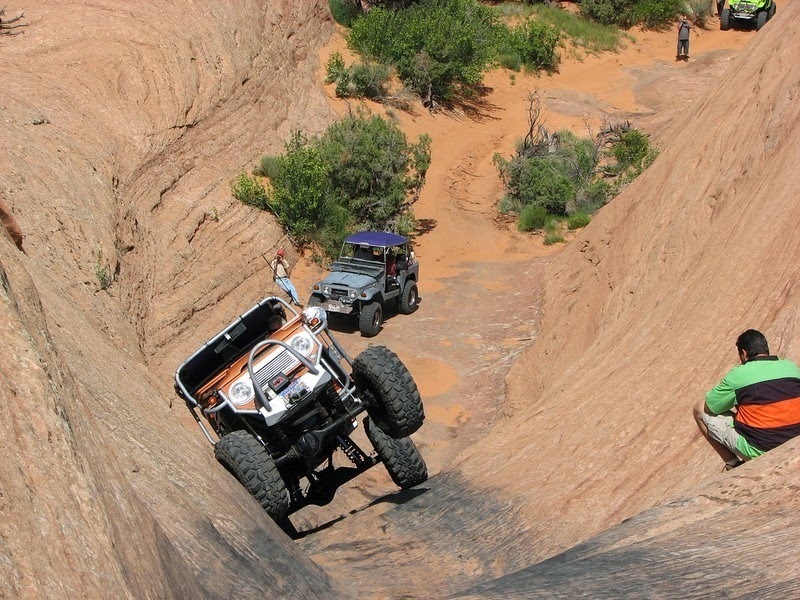 Looks like it was a fun day out, here’s hoping you can score an “extended” test drive in an off-roader for a weekend. Me too. Speaking of weekend trips – lucky for us here in the states, we have a 3-day holiday weekend coming up for Memorial Day. I’m looking forward to spending a little bit of time on the road. Looks like I’ll be meeting up with Jason from New Mexico. 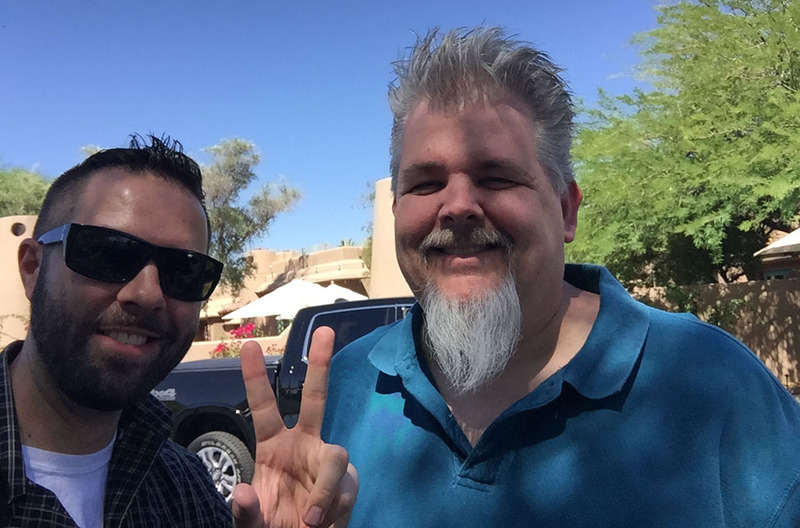 Hope your week is going well, Adam! Jason must be getting pretty close to a milestone in his car? Nothing quite beats a long weekend, we have one the week after – I’m just busy planning a trip away now, which happens to coincide with my two year anniversary with the ST. Look forward to hearing about your trip away. I loooove the new JL Wranglers! Definitely need to test drive one just for giggles. My F-150 has the same trailer blind spot setup and it is MONEY for long-distance and/or nighttime towing in traffic. The Ford supports trailers up to 33′ in length. Really dig the new Ram but they weren’t available yet when I was ready to buy. Yeah, pretty genius trailer towing tech. I remember a few years ago when Ford first debuted its “trailer backing” system – probably your current pickup has it – where you just throw the vehicle in reverse and use a round dial on the dash to direct where you want to go. For me it was a little less intuitive than just trying to back a trailer the old fashioned, but some people loved it. It does have that “Pro Trailer Backup Assist” – I’ve used it once to see how it works, and still find it easier and faster to just back the trailer up myself. The adaptive cruise control and lane keep assist are pretty brilliant, though. They make road trips so much easier.